Summary: Media attention can be helpful for your bank. However, cyber criminals can use the resulting information for attacks against you and your bank. How to be media savvy and safe. You may find it odd, but Ancient Egyptians reportedly used slabs of stone as pillows. Imagine a pillow fight back then! 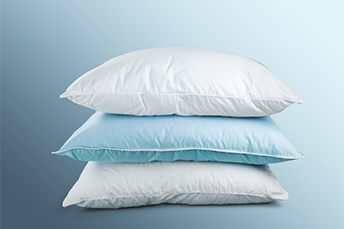 In more modern times, experts say you should replace a feather pillow about every 8Ys, a down pillow every 7Ys and a polyester pillow every 1Y. Guess you don't need to worry about that too much if you are still using a rock. No matter how you slept last night, you know that publicity of all sorts is usually good for the bank. You should also know that when you take the time to talk with a reporter, you're doing them a favor. Financial and general publications rely on banking specialists as sources of ideas, information, and quotes. On the other side of the pillow, the reporter is also doing you a favor. When you're quoted as an expert in your field, the people who read your quotes learn about your expertise or confirm the positive ideas that they already hold about you as a professional. Your fame goes further afield than you could send it on your own, and the charge it carries is typically positive. To improve your press interactions, here are some tips from Chapman University: practice doing interviews, be brief and to the point, think about what readers need, don't be neutral and try to take all sides of an issue, never say no comment, do not ask if you can see a copy of the article before it is published, do give numbers and statistics, do ask the journalist if they need other sources and be sure to provide your contact information. Many businesses post links to articles that feature them or their staff members on web sites and social media platforms. Those links amplify the story and put it where people who are interested in you and your bank are especially likely to read it. Unfortunately, cyber criminals can use print, online, and social media as reconnaissance tools to help craft attacks against you and your business. As an example, let's say that a reporter quotes you as a speaker at a national banking conference. That's positive coverage, but someone with less than positive intentions could use it to target you with a phishing email that contains a malicious link. You're more likely to open an email and attachment that appears to come from conference organizers, after all, than to open an email from someone unknown. To take our example a little further, let's say that the reporter sends you a link to the finished article. Pleased with the coverage, you post the article to your LinkedIn page. Cyber criminals may also use LinkedIn to mine for employee email addresses, so your posting could help send a phishing email containing a virus, a link to a malware-infected site, or ransomware to your entire bank. Still, this isn't a reason to stop talking with reporters or publicizing articles that show you and your bank in a positive light. Good relationships with members of the media, plus a willingness to show coverage to your current and prospective customers, are powerful ways to create and disperse positive impressions. That said, just make sure to safely cushion yourself from the big bad cyber criminals, especially with email. Email is still the #1 way cybercriminals breach businesses, including banks. So, practicing scrupulous email hygiene is critical, as you stay in the limelight. Bank Director's 2018 Risk Survey finds senior bank executives report the following ways technology is being used for compliance: BSA/AML (93%); vendor management (73%); KYC (60%); Community Reinvestment Act (52%) and consumer compliance (44%). When asked how they would like $1,000, 70% of people surveyed said they would rather have their money in cash or investments than in the bank, according to a recent WalletHub survey. Credit card issuers reported higher delinquencies last month. Delinquency rates by issuer were: American Express (1.05%) up 4bp; JPMorgan Chase (1.24%) up 3bp; Bank of America (1.75%) up 2bp; Discover (1.84%) up 3bp. US retail investment assets under management rose 14% in 2017 to $60B. According to a new study, businesses that used personal debt to fund operations had on average 57% less revenue than those that hadn't borrowed at all. Businesses that borrowed from banks not only gained a business credit profile, but also a mentor from the bank, which positively affects business revenue. Online lenders do not report their loans to business credit bureaus so you don't build your business credit with them.